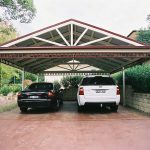 Superb Pergolas N Decks specialises in building patios in Adelaide. We have been building patios in Adelaide for over 20 years. As we are a Straco Pavilion dealer we are able to use there a whole range of products and materials. You can experience the best of outdoor living with a Stratco Patio, due to the quality of the material. Create a patio space that can be enjoyed throughout the year with some outdoor blinds. Under a Stratco Patio, you are protected from the elements, expanding your possibilities for entertaining. If you need any more information about Stratco patios please visit the link.